Earlier this year a Swedish family called Lindell embarked on an ambitious project: to reduce their carbon dioxide emissions to less than one tonne per annum (each Swede currently contributes six to eight tonnes annually). The family pursued two strategies – a change in lifestyle and the adoption of advanced technologies in an effort to minimize their carbon footprint. The Lindells swopped their 1970s home and 10-year-old car for a newly constructed, climate-smart wooden house and a battery-powered car. They achieved a further cut in carbon dioxide emissions through their diet, by varying their choice of meat and eating more vegetables. At the end of the trial period of six months, the family had reduced their emissions by almost 80% and demonstrated what is possible when a policy of innovation to zero is adopted. Siddhartha Mukherjee has concluded that even a complete “knowledge of cancer’s biology is unlikely to eradicate cancer fully from our lives.” So, if we cannot innovate to zero breast cancer, what might it take to innovate towards zero deaths from breast cancer? The Oxford Health Alliance is a British non-governmental organization that has promoted a movement called 3four50: there are three lifestyle choices – smoking, poor diet, physical inactivity – that cause four chronic diseases – cancer, diabetes, heart disease, and lung disease – that kill more than 50% of humans. So, the first step to reduce breast cancer deaths would be to recognize the beneficial impact of a healthy lifestyle: some estimates suggest that 40% of breast cancer cases would be prevented. The next step would be to ask what role innovative technology might play in detecting breast cancer before clinical symptoms appear. 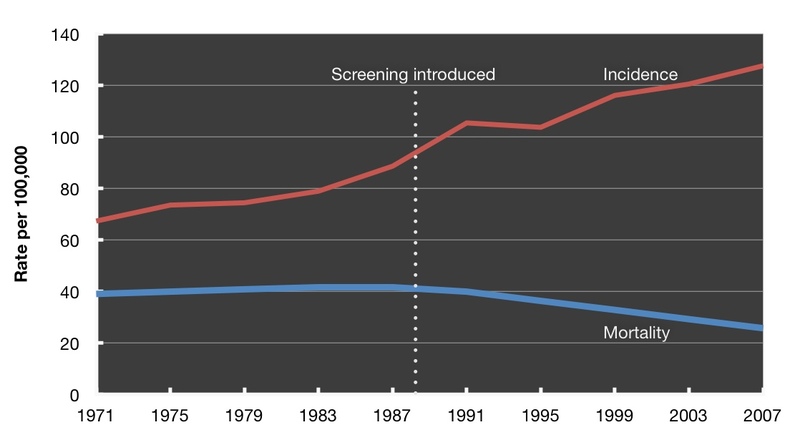 This is where screening and mammography have been making such a vital contribution for the past few decades, as shown in the figure below (source: NHS Breast Screening Programme). But mammography still misses many cancers (a false-negative diagnosis), particularly in women with dense breasts, and, to exacerbate the problem, breast cancer is a heterogeneous disease, with varying rates of progression. What is needed is a test with 100% sensitivity and specificity that can rapidly and inexpensively detect the variety of breast cancers at an early stage. Our industry needs the equivalent of the Lindell family’s new Volvo, its electricity sourced from hydropower. The search for the Holy Grail of breast cancer detection continues. The introduction of screening mammography in the UK in 1988 resulted in a decrease in breast cancer mortality.